I’ve just recently become aware of the concept, and term, “Big History”. It happened when I saw a coffee table book, shown here, at Barnes & Noble a couple weeks ago, and glanced through it, noticing two names I recognized: Bill Gates, who provides a front cover blurb; and David Christian, author of a book called Maps of Time, which uses the term in its subtitle. Christian provides an introduction to this coffee table book called Big History, though the balance of the book is apparently more of an encyclopedia, with many contributors on diverse topics, than a book written by one person, as Christian was of the earlier book. I bought Maps of Time a couple years ago, for its timelines and its scope, starting from the origin of the universe and proceeding, stepwise, through the formation of the stars, the planets, Earth, the history of life on Earth, through the dinosaurs and mammals and primates and eventually to us. Each section being a subset of the previous, in a sense, like a series of Russian dolls, moving from timescales of billions of years to millions to thousands and then to the last hundred or so. 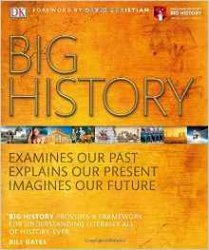 Big History has much the same hierarchical arrangement, but with lots of diagrams and photos and maps (and timelines) to supplement the text. Big history, now, this is much more interesting. In fact I’ve been playing with arranging my nonfiction bibliography in some kind of roughly sequential arrangement — cosmology to astronomy to evolution, to evolution of the mind and how the human mind operates on psychological principles very different from the accurate perception of reality — and here come a couple books that outline this context for me. It’s a “multidisciplined” subject and, like science itself, ideally has no particular national or ethnic focus or bias. Now Amazon points out, via its clever “you may also like” ads, that David Christian and two coauthors have written a textbook version called Big History: Between Nothing and Everything that appeared in 2013. It looks fascinating too, but as a textbook, it’s expensive ($92) so I think I’ll peruse these first two books before I consider that one. — Oh and wait! Just as I’m posting this, I come across a site called Big History Project, with lots of videos and outlines and free online courses. I’ll be exploring it. This entry was posted in Cosmology, Evolution, Human Progress. Bookmark the permalink.